If you are a developer who wants to use Oracle to build effective, robust, and scalable software applications, look no further. 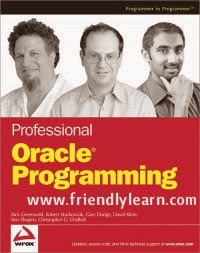 Written by a team of leading authorities on the Oracle database, this example-packed book is divided into three main areas: how the Oracle database works, how to use SQL and programming languages to access Oracle, and how to use the features of Oracle effectively in creating your applications. After an overview of the topics you need to know in order to use the Oracle database effectively, you'll get helpful tips, techniques, code samples, and examples written in Oracle Database 10g. Along the way, you'll learn how to access and manipulate data in the Oracle database, implement logic with various programming techniques, use raw data in a database, and, ultimately, create successful applications.